The Majestic-12 documents represent one of the major areas of controversy in the field of modern UFO research. If you accept them as authentic they validate many of the darkest conspiracy theories about government involvement with extra-terrestrials; if not, they pose a whole host of other questions which, in their own way, are almost as intriguing. Posted anonymously to various UFO researchers, the documents began to surface in the 1980s. New ones continued to pop up here and there until the 1990s, when the flow ceased. Some came in the form of camera film, others as paper photocopies. Ranging in dates from the 1940s until the 1990s, they describe a secret committee of twelve American notables, formed on the orders of President Truman in 1947, to deal with the aftermath of the Roswell crash, and with the extra-terrestrial problem in general. It was known as Majestic 12, Majic-12, or MJ-12, and its members were drawn from the worlds of science and national security. CIA director Roscoe Hillenkoetter headed it up, and such scientific luminaries as Einstein, Wernher von Braun, and John von Neumann are said to have played a part in its deliberations. According to the documents’ account, four alien corpses were recovered from the scene of the Roswell incident and taken away for study. Later documents describe procedures for the recovery of debris from a UFO crash site, including instructions for the handling of alien corpses or even live extra-terrestrials (described in the documents as EBEs – Extra-terrestrial Biological Entities). Mention is also made of the need to create cover stories to divert public interest in any incident that takes place. The emergence of the documents unleashed a torrent of dispute about their authenticity. Almost theological debate has raged about minor details of typeface, date formatting, or linguistic style which sceptics claim irrefutably prove that the documents are modern forgeries. Supporters of the documents refute these claims with equal vigour, and cite examples of contemporaneous documents, known to be authentic, in which similar formatting idiosyncrasies appear. UFO debunker Philip J. Klass pointed out that, on one of the documents, what purported to be the signature of President Truman was, in all respects, identical to a copy of his signature which appeared on another, non MJ-12 related document. Since no two signatures are ever exactly the same, he argued, this proves the document was a forgery and that the signature had been copied. Others suggest that the duplicate signature may be accounted for by the White House’s use of a signature stamp. Many minor details of the Majestic documents, after thorough research, have been found to check out. For example, the documents mention a meeting between two men on a certain date. UFO researcher Stanton Friedman rummaged through document archives and found that the two men did happen to meet on that exact date, and that, furthermore, such meetings were not common. If the document was a forgery, therefore, it was a forgery which had been very carefully concocted; the forger must have expended significant resources of time and money to ensure such accuracy of detail. This begs the question: why? No one has made much money from the documents. They can be read freely on the internet. That it was done all for the simple pleasure of mischief-making seems a little far-fetched too, given the effort that must have gone into it. Among the MJ-12 documents, one particularly intriguing find is what is known as the Cutler-Twining memo. There is nothing especially remarkable in the content of the document. It simply refers to the time of a meeting. It does contain the designation “MJ-12,” though. What makes it special is that this document was not posted anonymously to UFO researchers; instead, it was found in the US National Archives, lending some objective credibility to the view that an organisation called MJ-12 did, in fact, exist. Debunkers claim that the document must have been forged then planted in the government archives. Given the security measures in place, however, this would not have been easy. At one point the FBI even got involved in investigating the documents’ authenticity. After all, if the documents had been real, a crime may have been committed in releasing them. The FBI determined that the documents were fake and immediately ceased its interest in them. “They would say that, wouldn’t they?” retort the believers. If the documents really are fake, it is difficult to conceive that any organisation other than a government would have had the resources to fake them so convincingly. But why would the government want to buttress UFO conspiracy theories? This is a deep subject - one that relates to the controversy surrounding the so-called Pentacle Memorandum. In short, some believe that, for reasons of its own, the government has deliberately nurtured the sub-culture of UFO conspiracy theories. 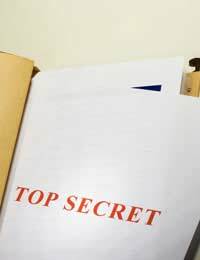 The existence of some apparently anachronistic detail has led many in the UFO research community to accept that at least some of the Majestic-12 documents are forgeries. Does this mean they all are? Sceptics say yes. Supporters say no. The supporters insist that, if the documents did represent a major leak of classified information, it is natural that the government would launch a damage limitation exercise to puncture their credibility. One way of doing this would be to float a host of fraudulent documents, knowing they would eventually be exposed as fakes, in the hope that the original authentic documents would be dismissed in the same way.